Frank Bagatto was born in North Eastern Italy and moved to Windsor with his family in 1950. He attended Assumption High, received a Bachelor Degree from the School of Commerce and Finance at the University of Detroit and his Master’s Degree in Health Administration from the University of Ottawa. Frank has a long list of accomplishments. As President and CEO of Hôtel-Dieu Grace Healthcare from 1990-2003, his experience within the evolving and demanding healthcare sector has made him a continuing asset to the current HDGH Board of Directors. 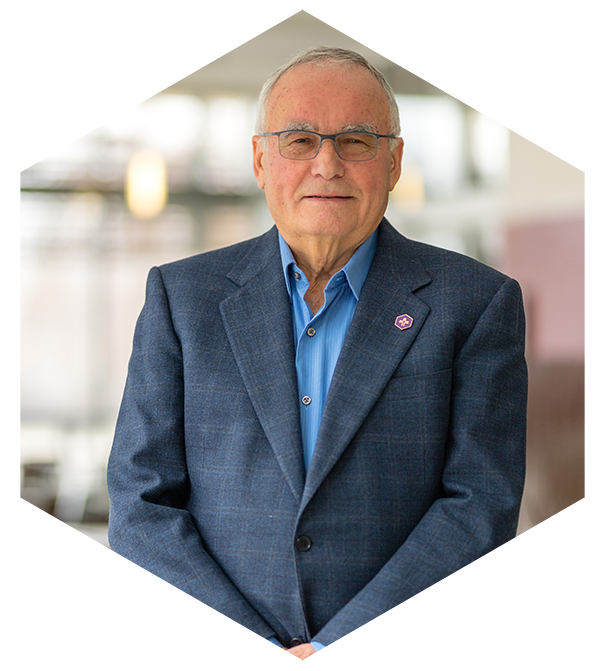 Frank’s leadership to such events, such as completing the successful merger of Hôtel-Dieu and Salvations Army Grace Hospitals provides him with the foundational experience to bring historical insight into organization decisions and frameworks. Frank’s list of leadership involvement in Ontario’s Healthcare sector spans over 45 successful years. Among holding high-ranking positions in Windsor-Essex such as the founding CEO of the Essex County District Health Council in 1976, the precursor organization of the LHIN, it also includes positions in Southwestern Ontario such as Executive Director of St. Joseph’s Hospital in Sarnia (1979-1990) and Assistant Executive Director at York Central Hospital in Richmond Hill Ontario (1968-1974). In 2003 he was interim CEO of the Hôtel-Dieu Shaver Hospital in St. Catharines where he facilitated the merger of the Hôtel-Dieu and Shaver Hospitals. He also served as a director of the Ontario Hospital Association, the Trillium Gift of Life, and Chair of the Board of the Catholic Health Association of Ontario. He also provided leadership at the national level, serving as surveyor for the Canadian Council of Health Services accreditation for over 15 years and Chair of the Board of Directors of the Catholic Health Association of Canada. Retiring in 2002, Frank certainly did not stop with his involvement in healthcare serving as board member and Vice-President of Planning with Catholic Health International, an organization that owns and sponsors over 25 health care facilities including HDGH. His post-retirement board of director involvements also included such integral community organizations such as Community Care Access Centre and The Hospice of Windsor and Essex County. Frank is also a member of the Rotary Club of Windsor and the Fogolar Furlan Club. In 1999, the Caboto Club awarded him with the Italian of the Year. Married to Gail since 1967, a graduate of the Hôtel-Dieu School of Nursing, they have two children and three grandchildren.